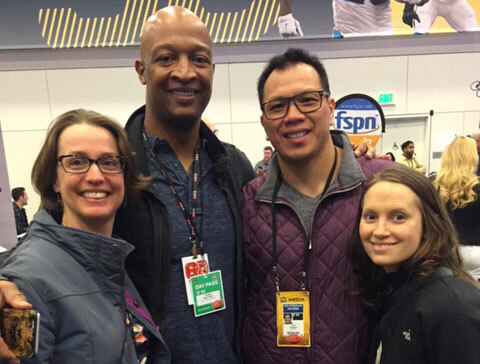 Lydia Bergen, director of operations for the Football Players Health Study (left), Alix Nozzolillo, associate director of player relations (right), with Nolan Harrison and Dat Nguyen, player advisors for the Study, at Super Bowl 50. To help spread the word on our Study, the Football Players Health Study team makes an annual trip before the Super Bowl begins to connect with players as they attend events at Radio Row, NFL Legends Lounge, and The Trust Locker Room Lounge. This year, for Super Bowl 50, was no exception. Over the rest of this pre-Super Bowl weekend, the Study team met with former players and advisors including Isaiah Kacyvenski, Dat Nguyen, Nolan Harrison, Lester Archambeau, Ed Reynolds, Eugene Robinson, Chad Brown, Charlie Batch, Andre Collins, Bernard Whittington, Don Davis, Ernie Collins, Latasha Wilson-Batch, and Rachel Terrill. Many of our player advisors participated in Radio Row, speaking their thoughts on all things football, as well as the Study. Eugene Robinson spoke on WTEM Maryland, Denver KKFN The Fan 104.3, and Sports Byline USA. Nolan Harrison made appearances on The Gridiron Show and 1280 Sports WHTK NY. Dat Nguyen and Jason Minnix from ESPN San Antonio invited Nolan Harrison and Lester Archambeau to speak about the Study as well.